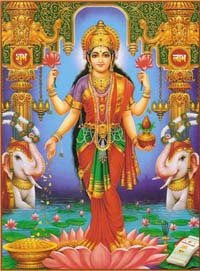 Kanakadhara Stotram is a popular prayer dedicated to Goddess Lakshmi and was composed by Adi Shankaracharya. It is said that Jagadguru Adi Shankara created this prayer on seeing the financial difficulties of a poor woman. During the time of Shankaracharya, students used to stay in the home of Guru and study. They also used to go around the houses in the village and used to beg for food for the day. Feeding a Brahmachari was considered highly meritorious. Once young Shankaracharya went to the home of a poor woman and asked for food. The poor woman had not cooked anything on the day. She did not know what to do and on searching, found a single gooseberry on a corner of her house. She offered the gooseberry to Shankaracharya and said to him that she did not have money even to buy food for her children. So please be satisfied with the gooseberry. Moved by her plight, Shankaracharya immediately composed a prayer praising Goddess Lakshmi and prayed to Her to remove the poverty of the poor woman. It is said that when Shankaracharya completed the prayer, it rained golden gooseberries. The prayer that Shanakracharya chanted on the day became popularly known as Kanakadhara Stotram.